Please refer to our stock # NB80 when inquiring. This fun resin necklace is direct from France and measures a generous 23 5/8" long. 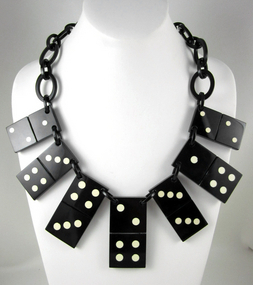 The necklace has 7 domino charms, ranging in size from 1 3/4"H x 1"W - 2"H x 1"W, with a hook and link closure. Perfect for game night. Be sure and look for the matching earrings, they're aces.